Your team was very easy to work with. Your communication was excellent and you responded quickly to questions. We loved Bird's Eye View. The furnishings were lovely, the kitchen had everything you could possibly need and the view was outstanding. Though it was advertised as sleeping 12, it would be better suited for 8-10. It is really hard to find a house with enough beds and bedrooms to comfortably sleep 12 adults. 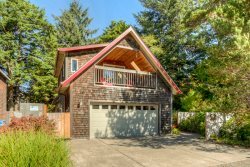 Besides that, we all thought this house was one of the best we've ever rented in Manzanita and we've been coming there for almost 20 years! We hope to return next year. The kitchen needs updating. The pot and pans were pretty old and there were not enough glasses for a family of 4. The utensils were old and pieced together. The soup ladle broke the first time we used it. Not a big deal, these things just need updating. It was a short walk to the beach and very cozy. View Property: ZZ Ocean Ave. The house was very well furnished and well layed out. The deck upstairs was such a treat to relax and be up away from people and cars. Amazing getaway! Had everything we needed and more! The management team was amazing and the house was very clean and had nice linens. The windows were even cleaned for our stay so we could enjoy the view. Thank you and we are for sure coming back! Danielle and her team are number one. She is friendly and always very helpful. I would never rent from anyone else. Danielle is very professional. She always makes you feel that you are her only custmomer. She takes pride in her rental company and it shows. All I can say is, We had an AWSEMONE experience. It was very clean. The Overlook has a beautiful view and very comfortable just like being at home. All correspondences with your team were great. Staff was very accommodating and responsive. We had a wonderful family gathering in very comfortable surroundings. The only improvement would have been usable wifi. Although there was a wifi signal, connecting was slow and none of us were able to use it. I suggest either not having wifi or upgrading connections to make it usable. Same thing with the counter top toaster oven, I would remove it or replace, current one is marginal.